Experimenting with sketchnoting as note taking and as visual summaries and slide design has been an area of intense interest for me over the past six months. Completely inapt, as an analog “artist” on paper, the use of a stylus and the iPad Paper app by FiftyThree, have allowed me to experiment with color, form, design, and typography. Sketching has been a solitary task for the most part. That is not a bad thing, possibly even necessary to be able to take full advantage of the thinking process unfolding when doodling. 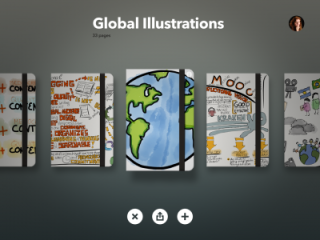 I have drawn my sketches and sketchnotes, organized them in journals within the Paper app, then exported them as images. The social network aspect of sketchnoting has not gone further than uploading these images to my blog or use them as a visual tweets disseminated to and receiving feedback from my network. In one incident, my network even prompted the creation of a sketchnote as another aspect of a concept. In comes Paper’s new platform Mix, that changes the game and the possibilities completely. Get inspired—Getting started is often the hardest part of doing anything creative. With Mix, you’ll find a well of inspiration from creators around the world, both in Paper and on mix.fiftythree.com. Whether you’re skilled at drawing, or just comfortable coloring and doodling, you’ll be inspired to create and learn on Mix. No more blank pages—Professionals don’t start from scratch, and neither should you. On Mix you’ll find templates, outlines, and ideas ready to be remixed and transformed into something new. Say goodbye to the blank page. Get and share feedback—Mix is a big, visual conversation, and some of the best conversations happen when people are invited to tell their own stories. Mix is about leaving open spaces for people to fill in, and letting ideas evolve in unexpected ways. Embedded in the app and connected to the Mix website, are now creators (or in Facebook and Twitter lingo, “friends”, ” followers and followees). You will receive the sketches, they chose to share, in your stream. On the left is a stack of “papers” that you designed and have made available to everyone else on the Mix website. On the right, you will also have a stack of sketches that you starred (on the website) and are now able to edit in the Paper app on your iPad. You can simply click on any of the images and your trusted Paper palette with your tools and colors will slide up from the bottom. Browsing on the Mix website, allows you to choose between a Learn, Sketch, Play, Write, Design and Think category. Featured creators invite you to check their stacks out or you can browse individually recently shared sketches in chronological order. Once you found a sketch that you feel inspired by, you can find the original creator and see all the other sketches the original one has inspired so far. It is truly a feast to see the creativity and different interpretations one sketch has inspired in others (ex. Ur Story by Brad Ovenell-Carter) . It’s more challenging than it sounds: I can easily capture what I learn from the keynote and almost as easily leave room for what I know I don’t know–a point I missed or term that needs defining or elaborating, for example. But how do I leave room for what I don’t know I don’t know–those infamous unknown unknowns? Where do I leave space? I think that instead of seeing my notes as a sort of record, I have to see them as an invitation. What does that look like? The 5 random facts about…. by roav, makes me wonder how different a book character analysis would turn out, if we asked students to choose and visually represent these facts in a social platform such as Mix? How would their classmates be inspiring each other and build upon their interpretations. Are these types of assessment “googleable”? Can students “cheat” and copy from each other to show evidence of their understanding? By moving you mouse over or tapping on the three dots to the left of the star, you can click or tap on “Go to Inspiration”, which allows you to get to the template. Just start the template and open it on your iPad to edit. With a click on the heart under the original inspiration you can see all the “spin-offs” it has inspired. For a moment, consider the thinking that you would put into the task of showing your interpretation of creating a visual to demonstrate a sum from the simple prompt below by 2urn. What would you come up with? Need some inspiration? Check out the remixes already being shared on Mix! Mauro Toselli has already taken advantage of his fellow creators on the Mix platform and shared his ideas on visualizing the term “teaching” hoping to inspire others to add their visual interpretation of teaching to the pool. How would you represent teaching? As you were considering your options and drawing them out, what types of thoughts would you have? What would you be thinking as you would consider sharing your drawing? Rafa Pagés shared a wall of frames, which seems to be begging other creators to add their touch to the wall. What if we were to ask students reading The Giver to put themselves in the shoes of Jonas and choose what memories they would display on their wall? What if a history teacher would ask their students to take a famous person in history and create a hall of fame for them? I believe that the team at FiftyThree has truly giving us a platform to re-think how we expose to, connect with and allow our students to experience creative, collaborative and connected thinking. They have coupled the tool to facilitate visualized thinking, taking advantage of the metacognitive learning in the process. What are your first thoughts of the potential of such a platform? How would you add? What would you contribute? How would you take advantage of the possibilities to transform learning for your students?